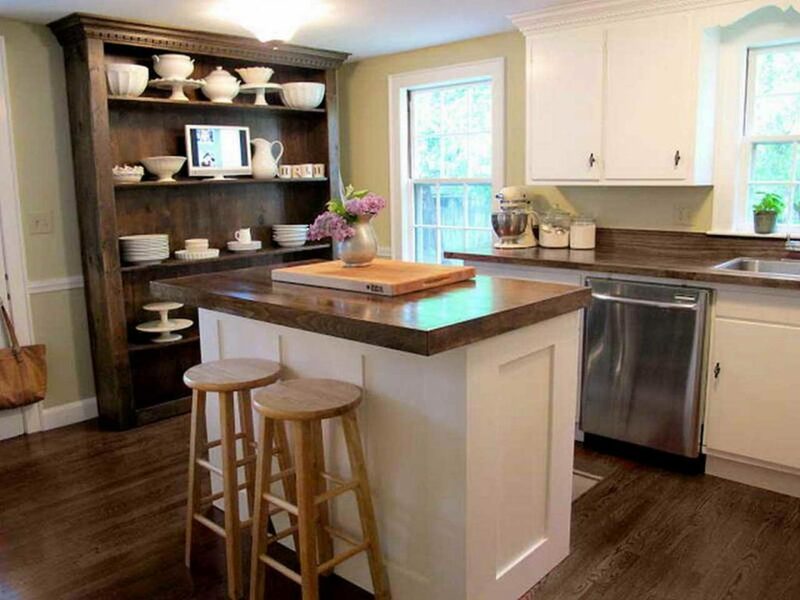 7 steps that make it easy for you to remodel a kitchen in a small house. Renovating a kitchen in a small house requires special attention. Of course, the arrangement is not just changing the cabinet or installing the stove. The arrangement also involves the process of workflow: washing, preparing (mixing) and cooking. The work process needs to be realized in a creative design. 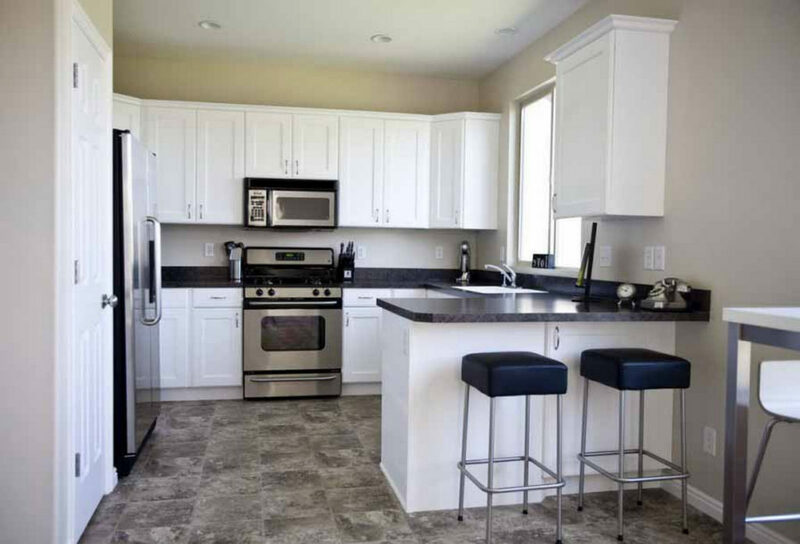 For maximum kitchen renovations, check the following 7 things! Kitchen work triangle has at least 3 activities that must be in the kitchen. Namely, washing, preparing and cooking. Each of these activities is interrelated and connected to each other. Usually, the interrelation of these activities forms a triangular flow. The flow aims to facilitate the sequence of activities. This kitchen work triangle makes furniture placement become easier. For example sinks, tables/islands, and stoves. When you want to cook spinach, you will start by washing the vegetables, then cut them, then the vegetables that have been seasoned entered into the pot to be boiled. The shape of the kitchen cabinet is divided into two parts. Usually, the upper cabinet (first part) is used to store food ingredients and tableware. While the lower cabinet (second part) is used to store cooking utensils. 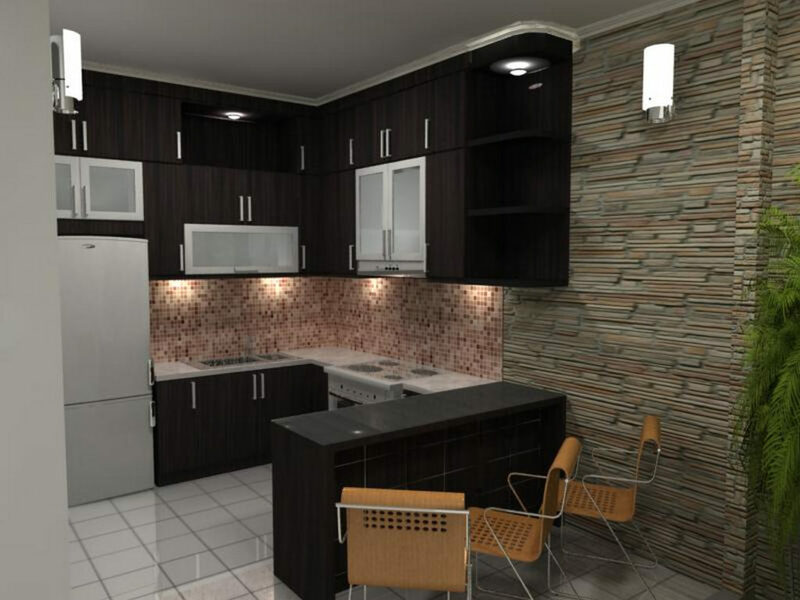 From the 2 parts of the cabinet, you can design the kitchen model according to your needs and tastes. Some people use the single line form, double line. There are also forms that resemble the letters “L”, “U”, and island. The choice of design is of course based on the condition and room wide. Kitchen appliance is useful to support main activities in the kitchen like cooking. The type is various. For example, stove, blender, microwave, and refrigerator. But before you determine the type of kitchen appliances, it is better to determine the primary kitchen appliances needs. Is a microwave really needed, while you rarely use it? Another consideration in choosing kitchen appliances is the consumption of electricity. Select which have low electrical power. A kitchen with cool conditions usually has a large enough window. The window is an entryway for air and light. Sunlight does not just illuminate the room, but also makes the air condition fresher. The window also functions as a way out for smoke that appears when cooking. Besides windows, smoke from cooking can be sucked up with a cooker hood which installed in the kitchen cabinet. There are 2 sources of light: sun and lamps. To facilitate the entry of sunlight, you need to build a large enough window. The location is not always close to the stove area. You can place the window above the sink. During the day, sunlight will make the kitchen bright. Sunlight can also help to make the sink dry after use. Clean water installation is a very important job when renovating a kitchen. You need to make a pipeline that goes directly to the sink. It’s okay, you use a cold and hot water supply. Usually, hot water is used to wash vegetables or clean the stains attached to cooking utensils. Wastewater installations require special attention. In addition to the shape of the pipe, the pipe material must also be strong. The P-Trap pipe type (a pipe that resembles a goose’s neck with a water trap) makes wastewater smoothly out without leaving some deposits from leftovers food. The P-Trap pipe is always filled with water. That’s what closes the entrance for insects and the smell of leftover food from the main sewer. 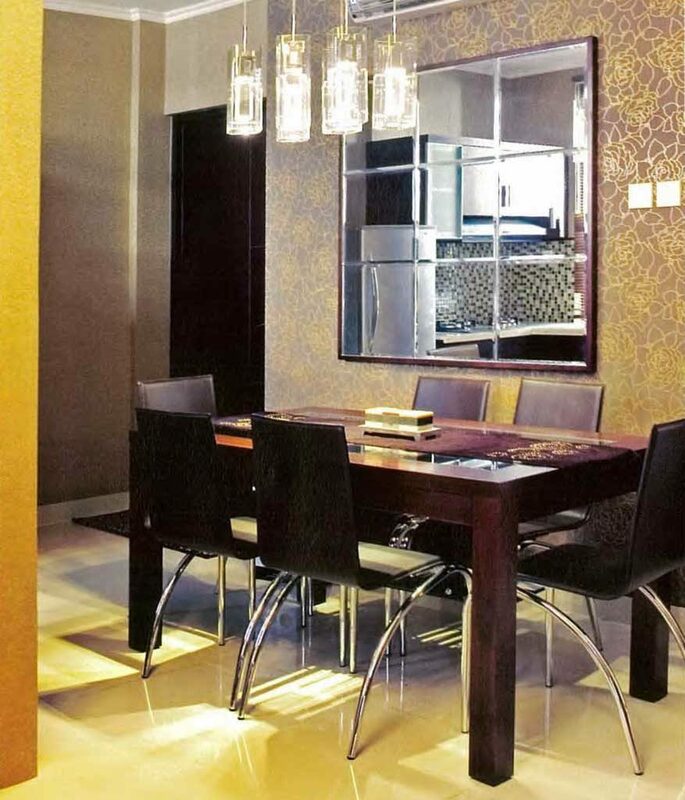 The warm dining table and mirror box managed to make the dining room warmer, more intimate and light. 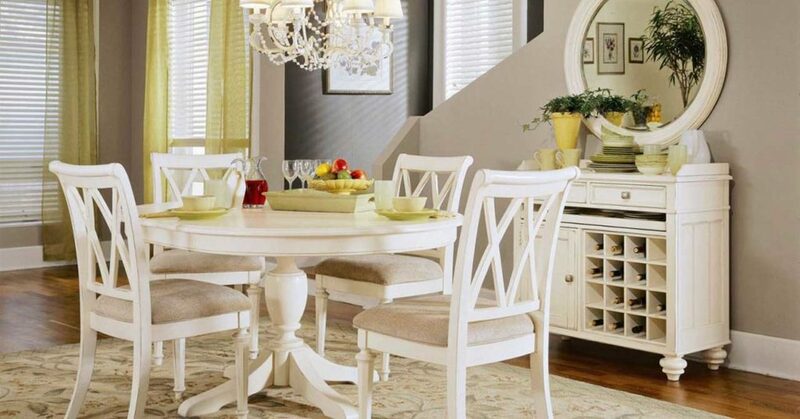 In this dining room, there are 2 inspirations that we can get. First, a dining table that uses a combination of materials; wooden table and stainless steel chair with fabric upholstered seats. As a result, the dining room becomes warm, intimate, and not boring. Wood also fits perfectly with the shape of the door leaf and the pattern of wallpaper that covers the wall. The second inspiration comes from a mirror that is framed by wood. Mirror, of course reflecting the dining room area into spacious impressions. With a mirror, the light can be reflected. The dining area feels bright, but not too dazzling. To apply these 2 inspirations, we just need to make sure the type of floor and ceiling. It would be better if the floor uses neutral colors and plain patterns. Luckily if the floor uses large ceramics so the room has a wide impression. Minimizing grout connection. The more grout, the room makes it look crowded. Another consideration is the ceiling that is wide and painted in white color. White paint will neutralize the room. 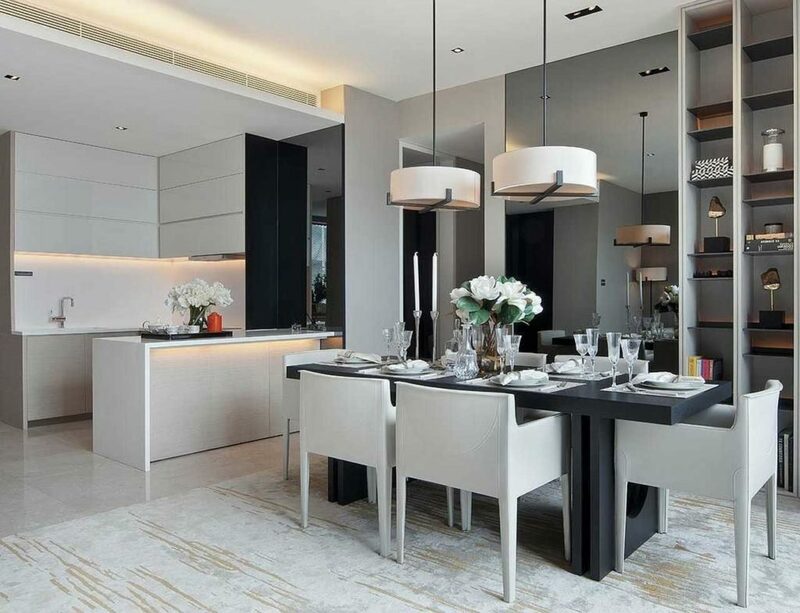 In this way, the dining table and mirror will appear strong and not make the room more crowded. Dare to try it? 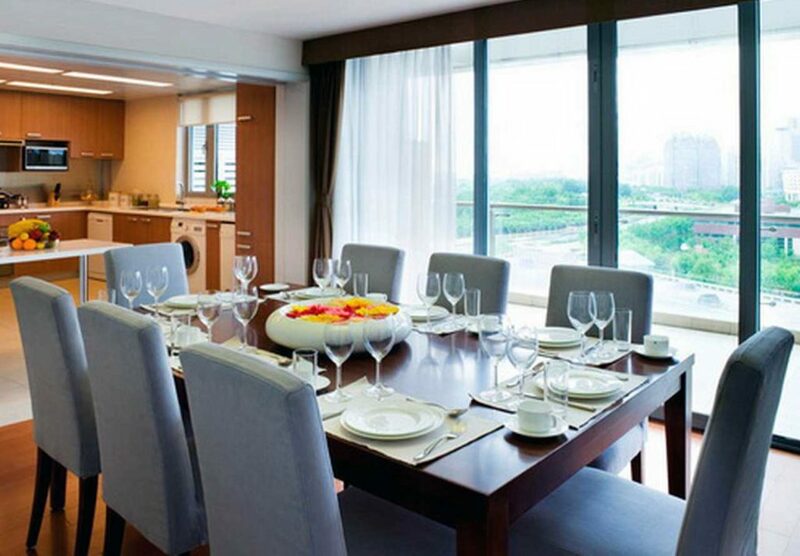 Teak wood for the dining table is prone to stains. 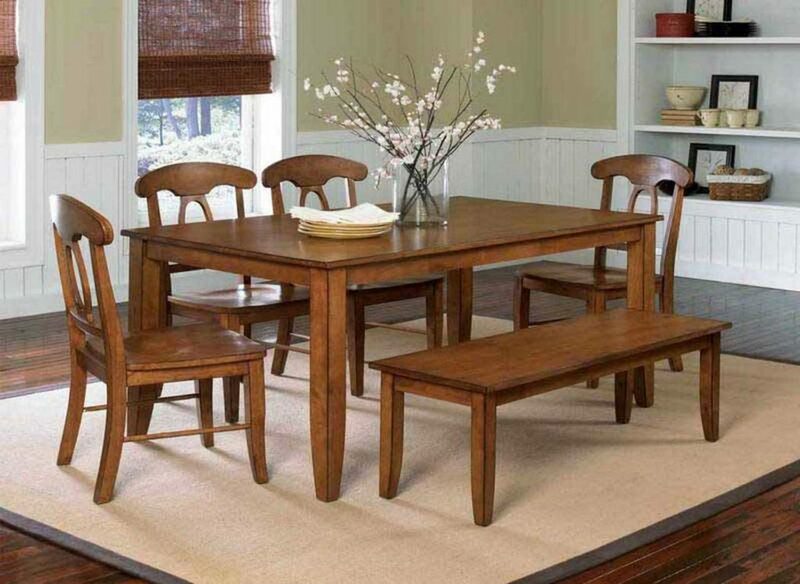 But don’t worry, there are several ways to treat teak dining tables. Teak wood is still the favorite until today, especially for industrial products and designs. Besides having strong characteristics, the beauty of the fibers contained in teak logs is also a feature of this material. In fact, many people are willing to reach into his pocket deeply to have it to beautify the interior of the residence. 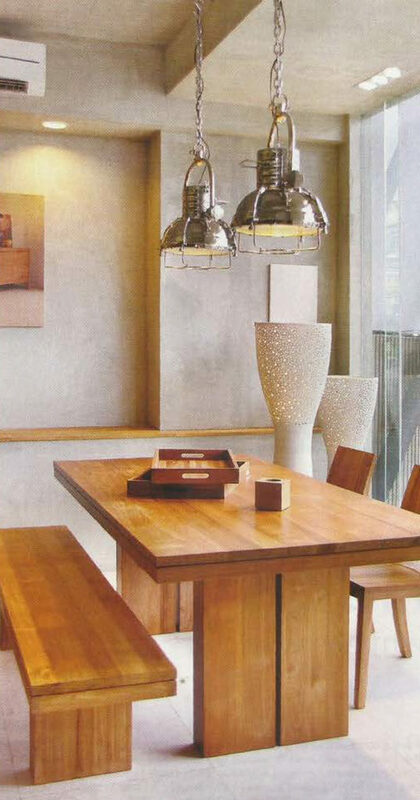 Using teak wood as a material for dining table sets is not a wrong choice. Although prone to stains and food spots, there is an easy way to deal with the problem, especially for the natural finished teak wood dining table. Come see the steps! If the stain is in the form of liquid or ordinary drinking water droplets, immediately wipe the surface with a wet cloth. After that, continue wiping using a dry cloth. However, if the stain is liquid soda or oil, then wash the area with dishwashing soap water, and repeat as the first step. Although the steps to clean stains on teak wood look easy, but if you leave it, the stain will settle and produce stain marks. To remove stains that have been long, clean by filing gently on the area using glass that has been blunted on the one side. Do this step in the same direction and slowly. To keep the surface of the teak wood table still glossy, do routine maintenance by providing a lacquer. So, if you would like acquire these outstanding images about Kitchen Renovation: Important Tips Before You Remodel It, simply click save button to save the pics to your laptop. They’re ready for transfer, if you love and want to have it, click save badge in the page, and it will be instantly down loaded to your PC. Thanks for visiting raysahouse.com, content above Kitchen Renovation: Important Tips Before You Remodel It published. 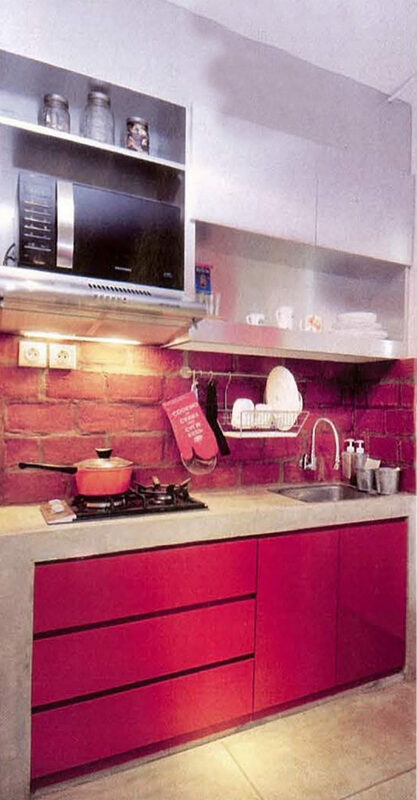 Many individuals trying to find details about Kitchen Renovation and of course one of them is you, is not it?